SEMINAR ON 3D PRINTING TECHNOLOGY AT 4:00 PM ON 20.9.16 AT VIA 2ND FLR CONFERENCE HALL 3D Printing is gaining popularity and started being used extensively by many industries and professionals like automotive, Jewelry, Healthcare and Architects. 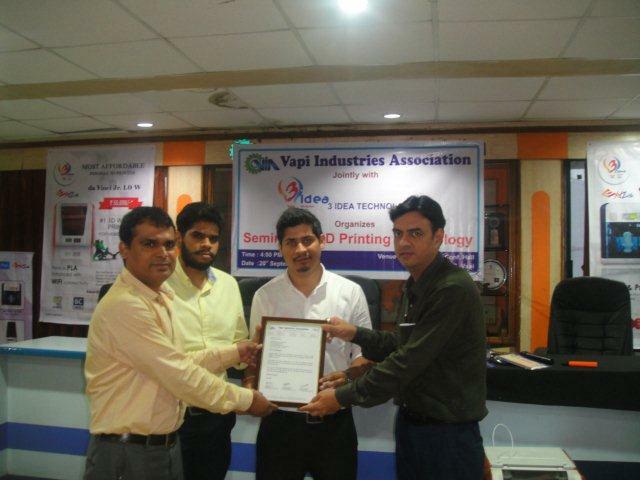 Vapi Industries Association has always taken initiatives to introduce new technologies and concepts to its Industries & Trade Members. 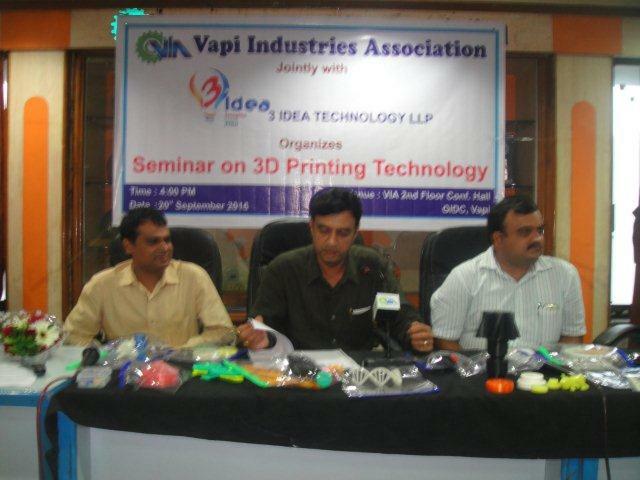 A first of its kind seminar was held at 4:00 pm on 20th September 2016, Tuesday at VIA 2nd Floor Conference Hall on 3D Printing Technology in this region to make the Industries & Trade Members aware about the utility and benefit of 3D Printing in industries & trade. 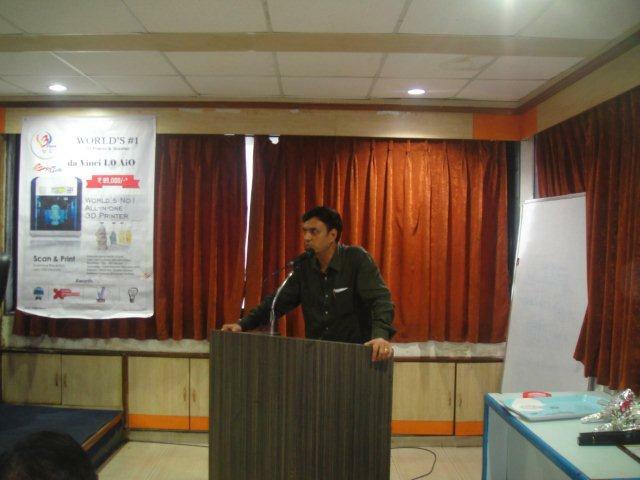 The seminar was jointly organized with 3 Idea Technology LLP of Mumbai. The Chief Operating Officer of 3 Idea Technology Shri Bibhu Ranjan Mahapatra delivered an introductory speech on 3D Printing Technology and his colleague Shri Nishant Singh, Reasearch Officer and Manager Shri Tarun Vohra gave presentation and live demo on the utilization of 3D Printing Technology in the Industries & Trade. The Seminar was attended by Shri Parthiv Mehta, Hon. Secretary, VIA, Shri Nirav Jani, Chairman – IT Committee, VIA, Shri Kaushal Pandya, Jt. Chairman – IT Committee, VIA, Shri Bhavin Shah, Jt. Chairman – Seminar Committee, VIA and many other Executive Committee Members and Members of VIA.